Today was the big day everyone hears about on the GDT. We are in the section that I consider the lost section. It’s known for its unmaintained trail and and high stream crossings. Today had two major stream crossings and hundreds of downed trees. So far, the overgrowth in this section has been tolerable and has not slowed our pacing as much as we expected. Due to that, we are 3/4 of a day ahead of schedule. That is nice and we will be able to add that time to our town time tomorrow at Saskatchewan Crossing (where we resupply, but will not spent the night) and reduce some of the bigger mile days leaving from there next leg. 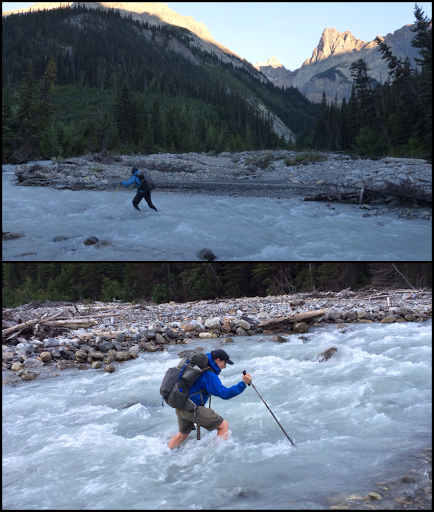 This morning, we wanted to get to the stream crossings early while they are at their lowest. We got going a bit earlier than usual at 6:15am and made it to the Cairns Creek ford by 6:40am. The description of this ford by other hikers is quite intimidating. On a normal year, it’s described as thigh high, very cloudy, swift, and sometimes impassible. We got real lucky with a low snow year and low water year this year. This ford was mostly knee deep, but still quite swift. I was very happy when it was behind us. 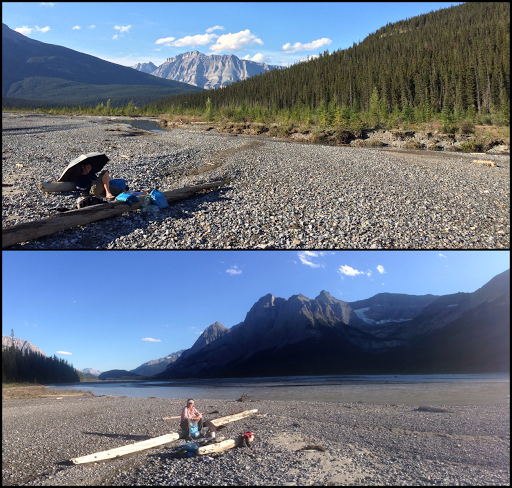 There was a log downstream that could be an option to crawl, but we chose to cross since the water level was so low. Once we crossed that, we were on the David Thompson Heritage Trail…or it used to be. It was quite overgrown in places, but thankfully mostly waist high brush. E was totally in her element following this overgrown trail and we both got into a nice rhythm and cruised it best we could for over two hours. This trail leads to the next major ford. 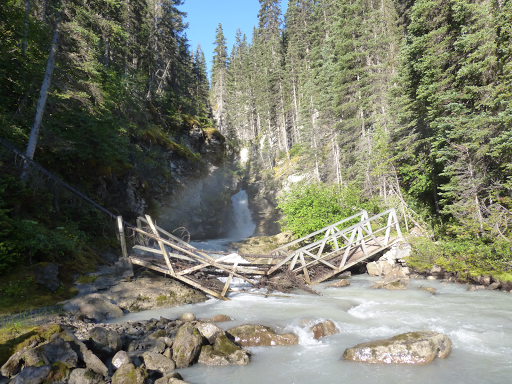 The broken bridge at the Lambe Glacier outflow. Each year, there is no knowing if this broken bridge will still be there, and if it is, how high the water might be flowing through it. 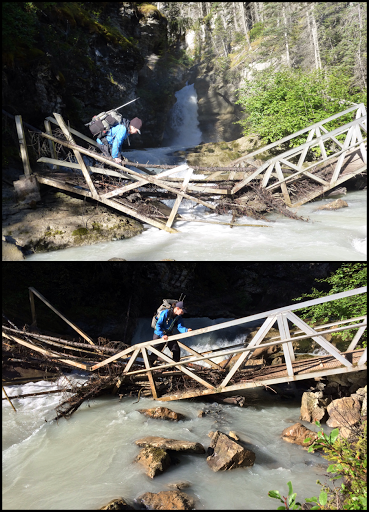 Once again, thanks to this low water year, we were able to easily cross on the bridge with logs there to step on. I don’t know if that would be an option on a higher water year. 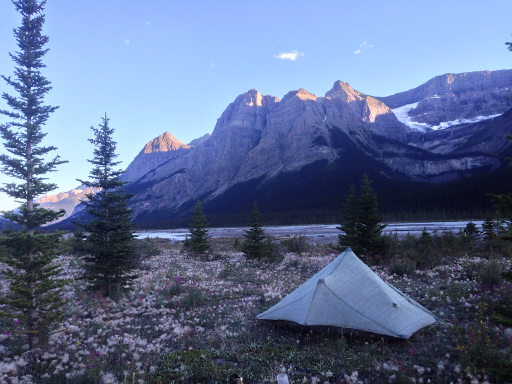 For both Cairns and Lambe Glacier outflow, we noticed the water levels were much lower in the morning, so I suggest planning camping accordingly to hit these in the morning. From the bridge, the David Thompson trail continued. 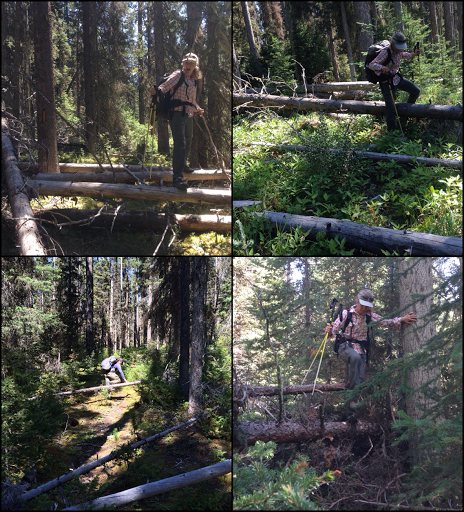 It was a gradual uphill to the mostly forested Howse Pass, which is significant for many reasons. 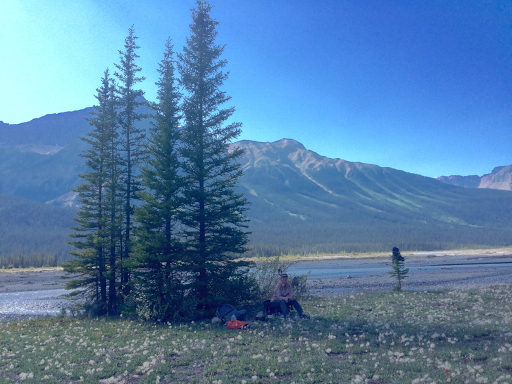 It is the boundary between BC and AB, last spot the GDT is on the actual Divide for 186mi/300km, and the boundary leaving Golden Forest District and back into Banff National Forest. 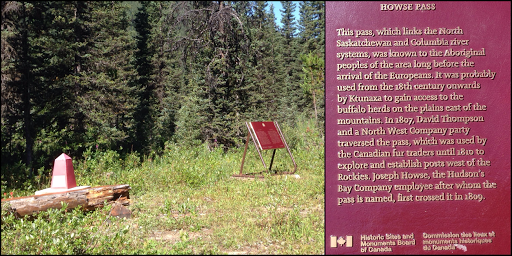 It is also a national historic site, and there was a sign explaining how this route was used. 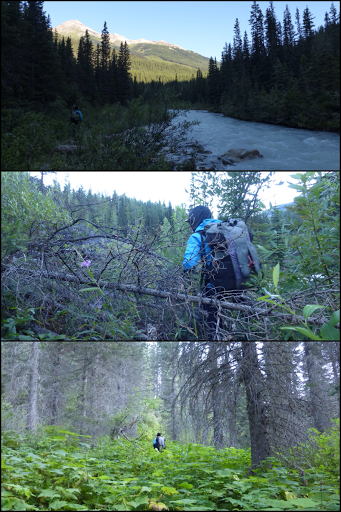 From Howse Pass, the trail was fair to follow with overgrowth covering much of it. Just about 30mins from the pass, was the final small stream crossing before the infamous blowdown section. We had lunch there and prepared for the worst. One note says a hiker once counted over 800 downed trees in this 9km/6mi section. Of course I had to count them. The description from past hikers has us expecting very slow conditions with constant climbing over trees. It ended up not being too bad and we took 3hrs to get through the 547 downed trees that I counted. It seemed that some of the downed trees were beetle kill and the rest were just fallen trees that haven’t been tended to. Many were small enough to keep a stride and step right over. 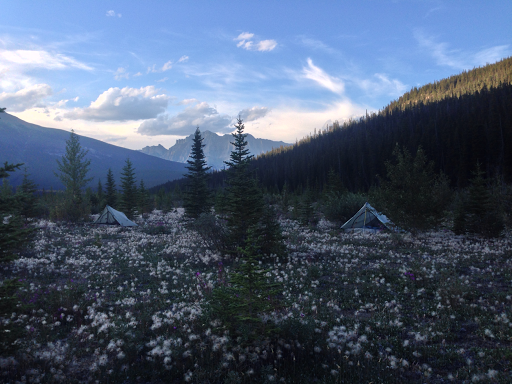 Hard to believe it’s in Banff National Forest and not maintained more because of that. It really wasn’t as bad as we expected. 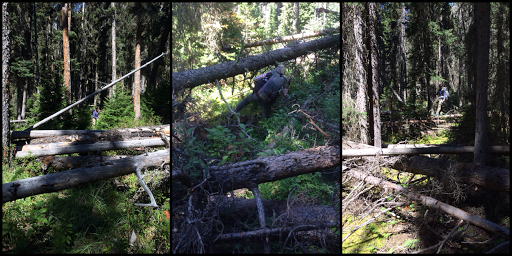 As we got further in, there were more clusters of downed trees to climb over and around and it got draining over time. We lost the trail a couple times in the really piled up areas, but the GDTA GPS track was helpful to have. It got up to 85F/29C and we were sweatin. It was nice to have shade in the forest though. After 3hrs, we broke out of the forest tothe Howse River Flood Plain. It was so freeing to be in that wide open space with a nice breeze and a shaded place to sit. It was almost 5pm and we could have set up camp IF we had camp water. Much of the major rivers in this stretch are glacial streams and quite silty. The trail continues in the woods along the Howse River and we decided to hike another hour or so to get camp water from a side stream. This section is 4mi/6km long and that will be the end of the really rough stuff. 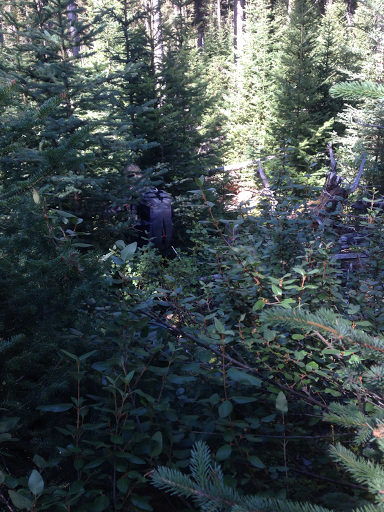 It was slow going through there with a fainter trail to follow and plenty of brush. We hiked til 6:30pm and found a great spot out by the river. It’s quite grand and wonderful to have this all to ourselves. For just the second time all trail, we aren’t hanging our food. There was nowhere to do that out here on the flood plain. We ate dinner on the shoreline. Here’s the view up and down stream. Once again, we didn’t see a single other person. Not surprising given the trail conditions. Well, that’s it. We just have a bit left to do tomorrow and we will have survived this obstacle course. We both have a few bumps/scratches/bruises, but overall found it to be much less draining and time consuming than expected. Don’t get me wrong, we’re tired, it just was faster going than we expected. The worst part wasn’t even the trees, it was the pine needle brush we had to push through. It was pokey and the needles got everywhere. I mean everywhere! They kept falling down the back of my neck into my shirt sticking everywhere with how much I was sweating. We also both have sore swollen shins that may bruise from going through tight brush that really pressed against the legs and swapped pretty hard sometimes. We were just glad all day to be going through it dry! We’ve been lucky with bugs this year and have had hardly any with no need for bug spray yet. Today, we had horseflies swarming constantly and really driving me crazy more than the terrain. They were terrible and bit through shirts and would get me when I was my weakest climbing over something. That’s when they’d take a bite out of the back of my hand. Tomorrow is another dry day to Saskatchewan Crossing to resupply. That’s two nights in a row with dry shoes and socks! Wahoo! Anyone know the name of these whispy wildflowers all around?